Renowned Aussie writerMichael Turtle Time Travel Turtle hurled question after question to a room full of travel bloggers, journalists, PR people and sundry others, all there to find out more about Thinking like a journalist to bring your posts to life. In less than an hour he engaged the audience at Traverse 14 with quirky anecdotes, snippets from his radio days, interactive updates on pc, handy tips and a selection of photos highlighting his progressive hair loss. The main messages I took away were to keep returning to the main point of the article, to keep the reader engaged because they get bored easily in this age of gnat’s attention span, and that good writing appeals to ALL the senses. 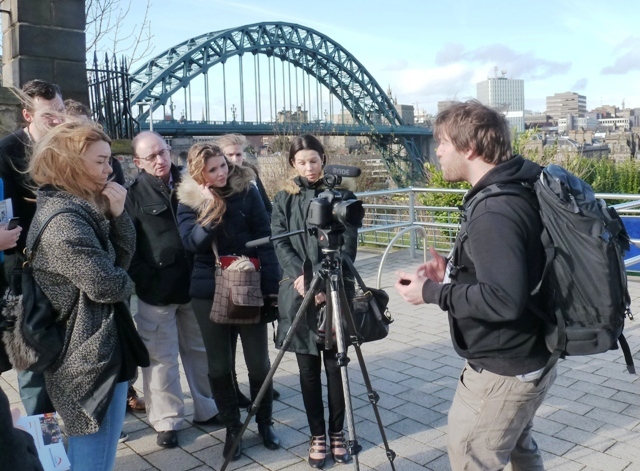 The previous night I’d arrived in Gateshead for the second Traverse Conference, attracting travel bloggers from all over the UK and further afield. The pre-conference gathering was at the Baltic Centre for the Arts. This beautiful building, with its Art Deco influenced lines was originally a 1950s Flour Mill. Saved from destruction, it was opened as a contemporary Arts Centre in 2002. Traverse had got a peach of a venue to kick of the event. One of the fun things about this kind of gathering is catching up with old friends and meeting new ones. “Oh hi, I recognise you. What’s your Twitter name?” was a common cry. We spend a lot of time relating to social media avatars in the world of blogging. 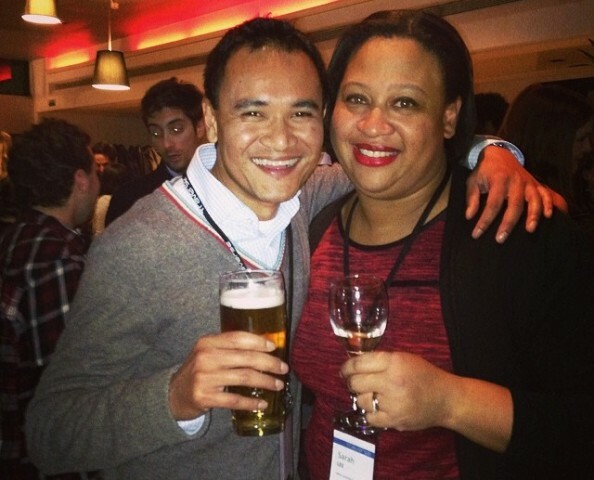 At a 1-1 Pro-Bar Jennifer Howze, award winning co-founder of Brit Mums, was very open about the challenges of helping travel businesses and PR companies to recognise the need to pay bloggers for their writing and promotion of client’s destinations. With the whole world of blogging and journalism in a state of flux, we’re all learning together. Have a professional deck [presentation] that has your statistics, measurement tools and case studies clearly laid out. Remember it’s all about the quality of your content and the unique relationship you have with your audience. Over coffee (scrumptious cakes shipped over from Denmark by DFDS Ferries) I had a chat with Pierce, representing the Netflights, the ‘cheap flight comparison’ website. Many thanks to them for the invitation to attend Traverse 14, along with fellow travel bloggers Lucy and Jan and find out what’s happening in the world of travel blogging today. make sure the video informs as well as entertains. Apparently Composition is a mistress’ – not sure what that meant; demanding and high maintenance maybe?! Another benefit of being at Traverse was catching up with business contacts. 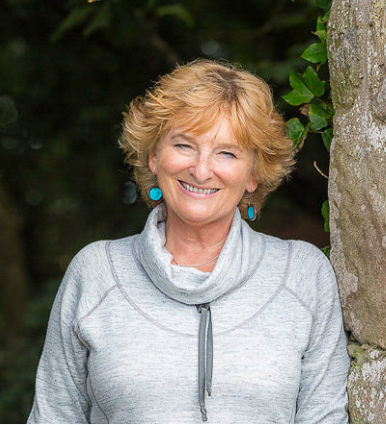 At lunchtime I met with Heather Cowper of Heather on her Travels and Sarah and Terry Lee of Live, Share, Travel. 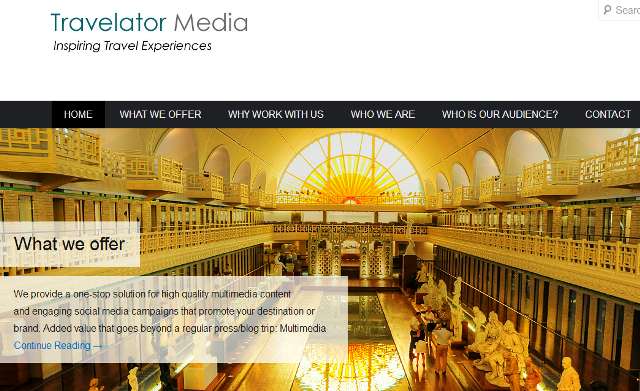 Heather, Kathryn Burrington, Gary Bembridge and I have formed Travelator Media to provide a one-stop solution for high quality multimedia content and engaging social media campaigns that promote a destination or brand. We work with clients to create ‘inspiring travel campaigns targeted at the 40+ UK quality traveller interested in arts, culture, food and finding new travel experiences.’ We then had a meeting with a leading luxury tour company and PR representatives from various other travel companies attending the conference. All very positive and useful – an added bonus to the weekend. The conference ended with a Q&A session to a panel of bloggers and PR reps, hosted by journalist Alastair Mackenzie. To be honest, I can’t remember the questions OR answers. It had been a long day and I was more taken by the Twitter Bar – post a tweet incl #Traverse14 with your seat row plus drinks option (red/white wine/beer/softdrink) and it was delivered to you seconds later. 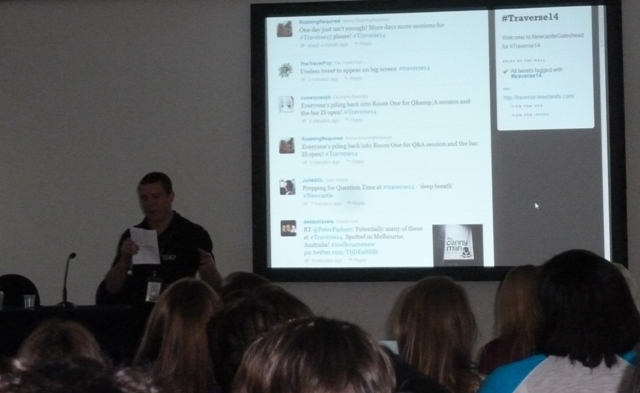 And of course the live ‘Tweets’ were entertaining distraction – possibly more so than the organisers had imagined! I came away from the weekend fired up with renewed enthusiasm for travel blogging, with useful tips and hints to improve my content, renewed friendships and made some new friends. 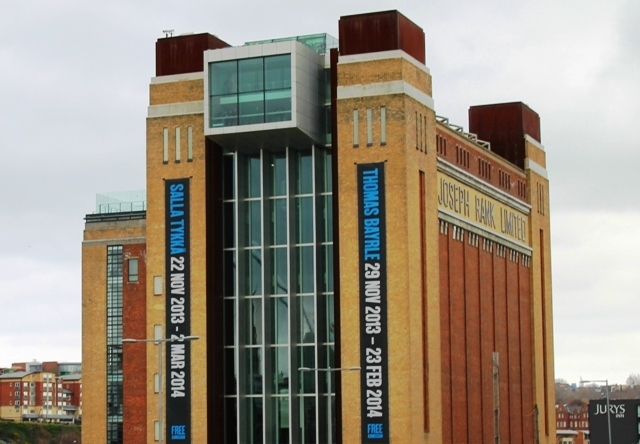 Traverse 14 was really well-organised, the venue was excellent and Newcastle Gateshead put on a great show. Returning to Michael’s key messages at the start of this post – how should it end? 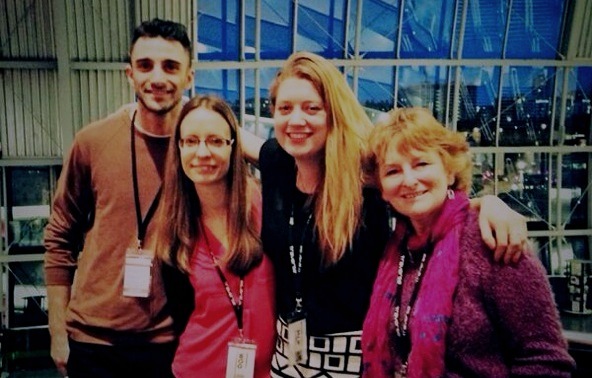 My top tip to travel bloggers is; Make sure you attend at least one Travel Blogging event each year. You’ll learn a lot and connect with some very interesting people. 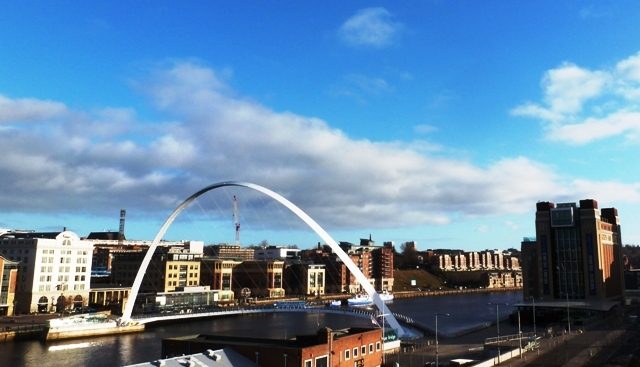 PS If you haven’t yet been to the North East, add it to your list – it’s a genuine quirky travel gem. And keep your eyes peeled for the Angel of the North, Anthony Gormley’s awe-inspiring sculpture. The very first travel blogger’s event I went to was TBU in Manchester (possibly 2010?) and at that gathering we heard from some of the best bloggers around – but it was hardly a business then. Now it is developing fast and we need to ensure that for those of us who do this as a job, not a hobby, there are ever better professional standards. Hopefully travel organisations, PR companies and others who hold the budgets for marketing and PR will recognise the need to remunerate us financially in line with the work we do for them. The coming years will be a very interesting time in this fast-expanding world of blogging and social media. Got so much from your tips on ‘Making a video using your iPhone’ Heather 🙂 There is just such a lot to learn and keep up with as a travel blogger! That’s why these events are so useful – and really agree re the networking too. Articles like these needs no introduction as it contains very useful and worthy content which helps new bloggers like me to get succeed. Thanks Sofia – glad you found it useful. These events can be very helpful to new bloggers, more experienced ones and anyone thinking of going into blogging. 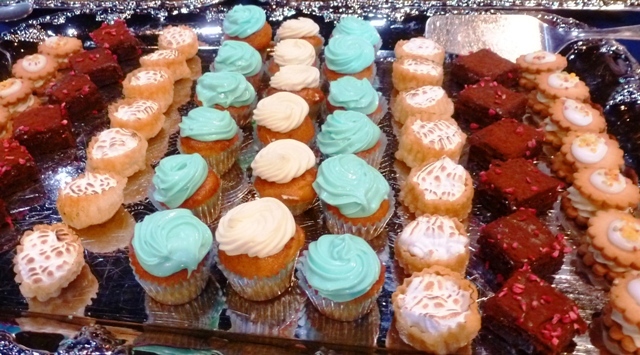 Interesting round up of a really good weekend at Traverse. It’s fascinating how much has changed in blogging in just a short amount of time. Bloggers are becoming more professional in their outlook and in the way they work with brands, which is great. But I tend to agree with Jennifer, bloggers who are taking a serious approach to their blogs need to be able to make money from their work, else they won’t be there in the longer term for travel brands to work with them. Equally bloggers need to have something solid to offer commercial partners. Conferences like Traverse can only help take blogging and the travel industry forward, so looking forward to BlogStock! So agree with you Sarah about the need for bloggers to make money from their writing and Social Media. We are being asked by clients to do more and more yet many still try to persuade us that they are simply offering us a ‘holiday’. I see our role as a marketing support for the clients we work for and we spend a lot of time ensuring that we reflect their product in a way our audience can appreciate. This converts into financial return for the travel companies and it is only right that the travel blogger should have some monetary share in this process. Most companies I have recently travelled with expect a fair amount of ‘live’ ie during the trip – social media coverage as well as a number of blog posts on return. We spend a lot of time nurturing our Social Media contacts which I am happy to share – but there is a price for my time and the work I put in for those clients. As you say, events like Traverse help to share the message and ensure all voices are heard. This is still in the early days and the most important thing is to keep communicating with reputable PR companies and quality travel providers to ensure we all benefit from this fast-changing, exciting world of blogging.